Mike Dillon was always industrious: as a boy, he painted store windows around the holidays to earn extra money. It’s a bird! It’s a plane! Well, sort of – it’s a paper plane. At 26 feet long, it’s the largest paper plane in the world – and it hovers over the entrance to Dillon Works in Mukilteo, Wash. According to its website, Dillon Works is a design and fabrication facility that “produces dramatic environments.” Clients across the globe – from Hong Kong, Estonia, and Moscow to Tokyo, Korea, and Portugal – come to founder and President Mike Dillon seeking sculptures, models, fixtures, accessories, and displays for theme parks, hotels and casinos, television commercials, and malls. 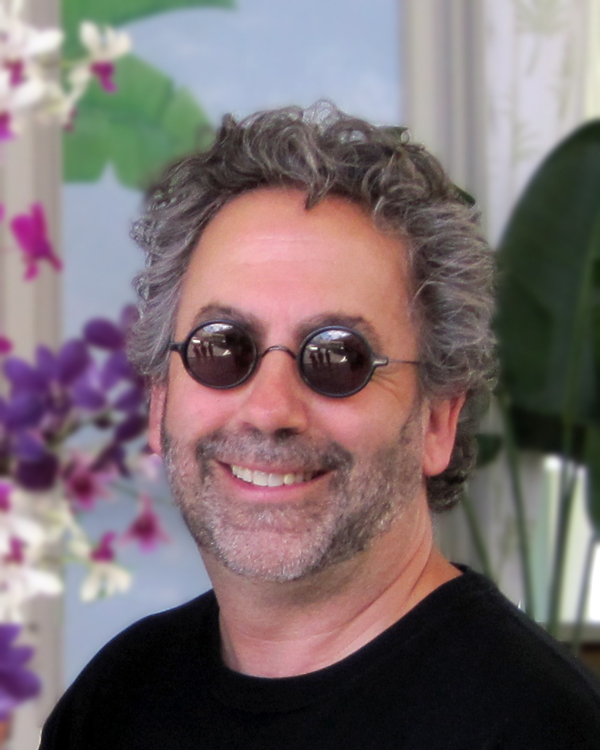 Dillon founded the company some 25 years ago after working as an Imagineer at Walt Disney Imagineering. Its mission statement is vague for a reason: the company’s project base is inextricably broad, ranging from floats for the Macy’s Thanksgiving Day Parade to giant snow globes to jewelry for Donna Karan. But it is precisely this diversity that helps Dillon Works survive economic downturns. Graduated from: Ellensburg High School in Central Washington. I didn’t go to college; instead, I started working at Disney at age 19, which I consider my schooling. Previous jobs: Worked on mechanical characters in holiday windows for Spaeth Designs; production assistant at Nordstrom; freelance producer in Los Angeles; Imagineer at Walt Disney Imagineering. Dillon Works is the home of the world’s largest paper airplane. Wingspan, 26 feet; weight, over one ton. What do you do at work all day? We work on a diverse range of custom design and fabrication because we bore easily. We’ve worked on 13-foot cupcakes for Dylan’s Candy Bar and a huge PlayStation Portable for the Sony PlayStation tradeshow exhibit for E3 (Electronic Entertainment Exhibition) in Los Angeles, which needed a forklift to lift it. At any given time, we’re doing about 10 to 12 projects. How did you come to land a job at Disney when you were only 19? While living in Los Angeles, I worked on sets and props for commercials and movies. Everyone told me that my style was very Disney, so I finally met someone – who knew someone who knew someone – who worked at Disney. I got an interview at The Walt Disney Studios, and the guy I met there connected me with someone in Imagineering. Then you created your own company, Dillon Works. Working at Disney was a great way to get paid, and I was taught by the best, but it was pretty corporate. The people above me didn’t seem very happy, and lots of people were getting laid off. I decided to leave before I could be laid off, too. Where did you start Dillon Works? In my mother-in-law’s basement in Seattle. I then moved it to a large garage and hired a few people to make mascot costumes. From there, we moved to a small rental space to three separate buildings to where we are today: our own 30,000 square-foot building on a large piece of property. 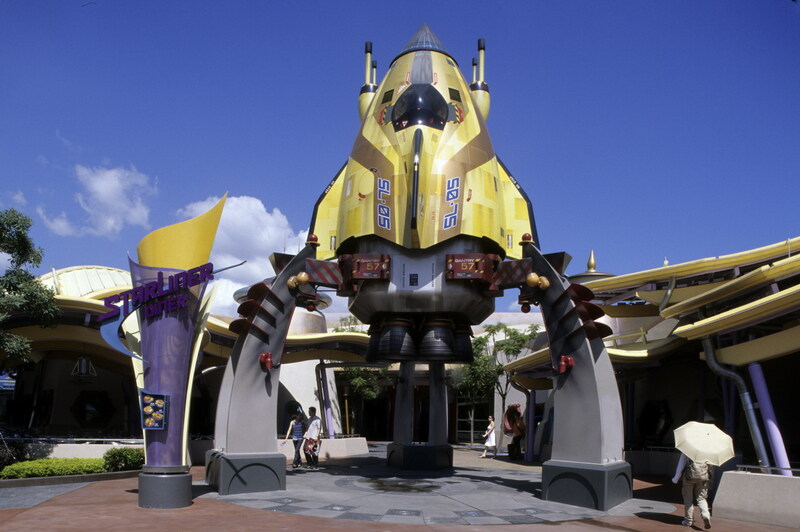 The rocket ship that Dillon Works built for Hong Kong Disneyland. Project that received the most recognition: Our Star Wars theater was written about worldwide, because I think it really strikes a chord with people. Making floats for the Macy’s Thanksgiving Day Parade was also a pretty big deal, as was creating a 35-foot tall rocket ship for Hong Kong Disneyland that weighed 11 tons. Biggest mistake, and how you learned from it: About 24 years ago, I built a submarine sandwich balloon for a sandwich store. It was too heavy, and I was worried whenever the wind picked up. Ultimately, I gave the store its money back because I didn’t know how to fix the problem. I should have known to tell them in the beginning that the project wasn’t going to work for their budget. Best part of the job: Creativity and exceeding a client’s expectations. Most challenging part of the job: Since I don’t have a partner, I’m the creative guy and the business guy. It’s good because I have nobody to answer to, but that also means I have no one else’s shoulder to cry on. 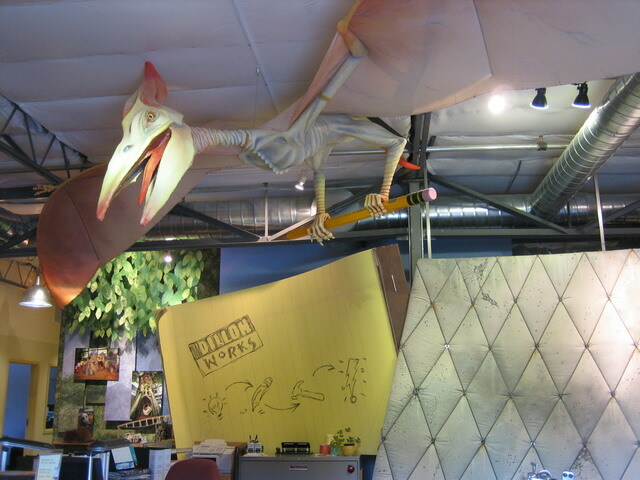 A large pterodactyl with a 32-foot wingspan looms over the front desk at Dillon Works. Something people don’t know about you: I bought my first car at age 14, before I was even old enough to drive it. Oh, and in Los Angeles, I worked on Galaxy of Terror with James Cameron, before he was James Cameron – he went by Jim. Growing up, you loved: A lot of geeky stuff, like magic and puppets. My mother sewed coat linings at home for extra money when I was growing up, so I learned to sew, too. That’s part of the reason we sewed mascot costumes in the early days of Dillon Works. Did your kids grow up with a plethora of cool toys? My two boys grew up surrounded by toys, so they got to try out all kinds of things. But they never had video games, even though Dillon Works did lots of projects related to video games. Pricing per project: They run from a few thousand to a few million, easily. But remember, some projects involve an entire casino hotel complex, like the Trump Hotels and Casino Resorts. Other hobbies: About two years ago, I started a second company called Alchemy Bluff Studios, which makes functional art furniture. It helps keep our employees busy during slow times. 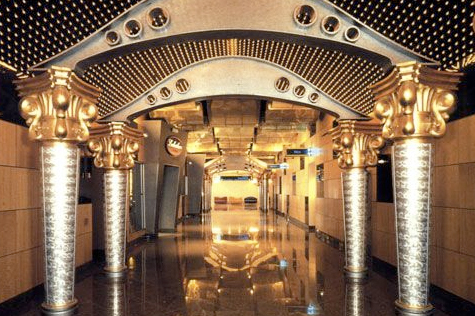 Another Dillon Works project: a hallway of arches that leads to the Trump Casino Boat in Gary, Indiana. The column capitals are vacuum-formed plastic, finished in an applied gold leaf. Mike Dillon shares three never-fail life lessons. 1. Keep your word; if you say you’re going to do something, do it. 2. Be creative with where you look for work; don’t pigeonhole yourself. Dillon Works makes it in this economy because we work on almost anything, from churches, hotels, and casinos to Donna Karan jewelry. 3. My mother taught me there are three sides to every story. Each person has his or her view, then there’s the truth. Explore Dillon Works’ portfolio here. All photos courtesy of Dillon Works. This entry was posted in Art and Design, Cool jobs and tagged design, dillon works, donna karan, macy's thanksgiving day parade, mike dillon, walt disney imagineering by Megan Hess. Bookmark the permalink.